Do you think they ate these on Downton Abbey? These are traditional English scones: fluffy and barely sweet. I bet they ate these on Downton Abbey. You know what I love? Baked goods with giant sugar crystals on top. Baked goods with crunchy nuts and chewy fruit will do the trick, too. Scones are such a winter food and although we had just a touch of spring the past few days, it’s dumping snow outside again right now (whhhhhyyyyyy?!?) but at least I have pictures of scones to comfort me. I loved loading these guys with giant sugar crystals. What a beautiful sight! They’re full of sliced almonds and dried cherries. To bring out the almond flavor, I added a bit of almond extract to the recipe and I’m glad I did. After my husband and I ate some, one lucky friend got all the rest to save our winter waistlines. Side note, I replaced the cream in this recipe with 2% milk for a lighter scone. In other news, spring you can come now. Note: I did this entire thing in a food processor (so easy!) so I will write it as such, but you can easily do this by hand. In a food processor, pulse together your flour, salt, baking powder, and sugar. Throw in your butter and pulse until it looks like cornmeal. At this point, transfer your dough to a floured work surface. Pile on your almonds and cherries and minimally handle the dough to fold them into the mixture. When it just starts to look incorporated and using your fingers, shape your dough into a circle about 3/4 inch thick and cut into wedges as pictured above. Try not to over-touch the dough. Transfer your wedges onto a baking pan lined with parchment paper or a silicone baking mat. Brush with some milk and sprinkle generously with sanding sugar. Bake for 8-10 minutes. Serve warm with a dollop of jam, butter and of course, a cup of coffee. Enjoy! 1. 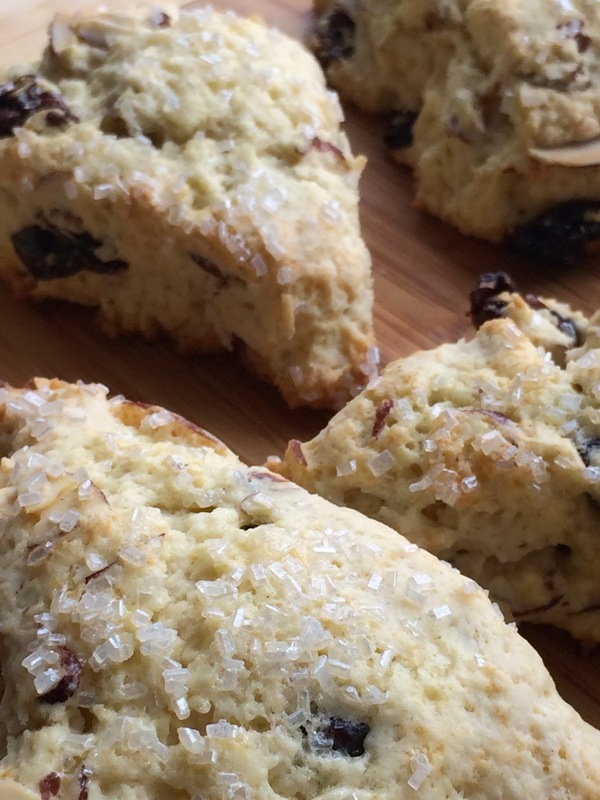 Cut this recipe in half and make a smaller scone round to make 8 – 10 mini scones. You can you the half of the egg to brush the top instead of the milk, too. 2. Shape the dough into a giant rectangle and make adorable square scones.